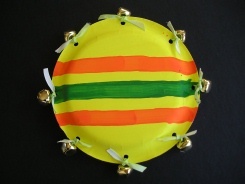 This Easy Tambourine is a great homemade instrument for any child. You may need to tie on the bells, put they'll love to decorate it and then play some music! 1. Paint your paper plates - eating side down. Once they're dry glue your plates together. After they are securly in place punch holes around your paper plate. With yarn or ribbon, tie on your bells. Now you're ready to make some music!